The new Apple iPad Air features a much-welcomed thinner design with a thinner bezel. The Apple iPad 5 is now official after it was unveiled with a new, thinner design and a new name, the Apple iPad Air. With Android tablets like the Amazon Kindle Fire HDX 8.9 and the Samsung Galaxy Note 10.1 2014 Edition now sporting ultra-light designs it was only a matter of time before Apple responded. Apple's new iPad has been given a design overhaul with a drastically reduced bezel on either side making the all-metal tablet easier to hold. The 9.7-inch Retina Display now sits in a design that is 45 grams lighter and 20 per cent thinner at 7.5mm. Despite this Apple has still decided to build the iPad using a unibody aluminium back and solid glass front. Unveiled at a special Apple event the new iPad will come in two colours, white and Space Grey. Specs have also been given a serious bump with the new iPad 5 now sporting an A7 processor along with the M7 co-processor which means it'll be running the 64-bit version of iOS 7. Apple has given the iPad Air a new five megapixel sensor. Should you fancy recording video the new sensor will also shoot Full-HD 1080p footage. The iPad Air storage options remain the same as the previous generation which means you'll have the choice of 16, 32, 64 or 128GB. Of course you'll also be able to choose between a WiFi-Only iPad Air or the WiFi + 4G but as usual the cellular option will come with a considerable price hike. While the base iPad Air will start from £399, the celluar model will cost £499. Apple's new iPad Air will come running iOS 7, the next-generation version of Apple's mobile operating system. Along with an all-new design iOS 7 comes with hundreds of new features including Airdrop which allows you to wirelessly share files from one iOS device to another over WiFi without using a router. You'll also get Control Centre which gives quick-access to essential functions along with the ability to control music and video. To see just how drastic the changes have been check out our iPad Air vs iPad 4 comparison piece. Article continues after our iPad Air hands-on video. 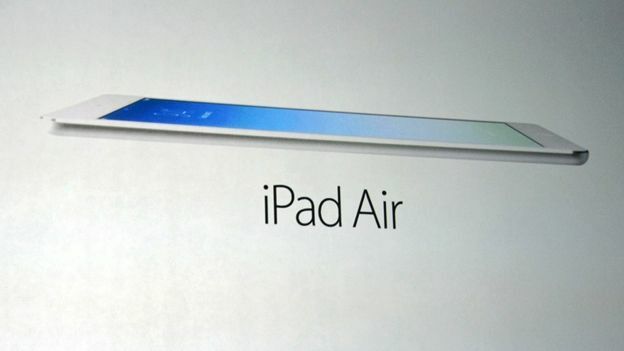 The iPad Air UK release date will be November 1st. Apple has not yet announced when it will be available to pre-order from. Prices will be £399, £479, £559 and £639 for the WiFi-only versions. Apple also unveiled a new iPad Mini with Retina Display which boasts a 2048x1536 display as well as the new A7 64-bit chip that can be found in the iPhone 5s. These weren't the only announcements from the event either as beforehand Apple had unveiled a new MacBook Pro with Retina Display and announced that Mac OS X Mavericks is free and available today.